Kim Heine is originally from Nebraska but currently resides in Florida. She has worked on boats for the past 3 ½ years and describes her career as one that she kind of fell into, happily fell into that is. Several years ago Kim became friends with a Ship Chef and would always hear stories from him when he got home about all of the interesting places he got to visit and cool things he got to see. Kim asked him if he needed an assistant because she would be interested in having a job like that. He told her that the boat he was on wasn’t hiring at the moment. Several months later Kim got an email from her friend letting her know that a position was available. Kim applied and has been working on ships ever since. 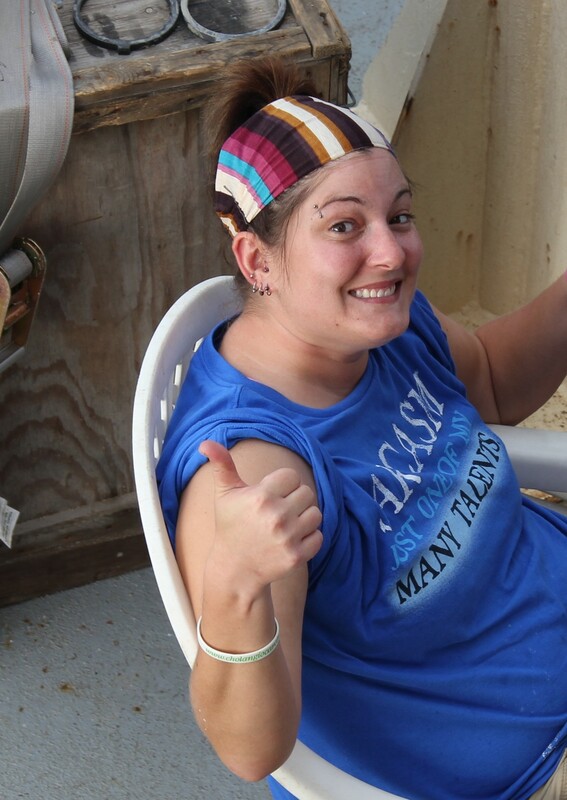 Although working on boats wasn’t something that Kim set out to do, since the beginning she has thoroughly enjoyed it. Her job on board the R/V Endeavor is Chief Stewart. Basically that means that she maintains the galley (eating area), decides the menu, preps and prepares food, and makes everyone on board very happy (by keeping their stomachs full). Kim works hard to prepare delicious selections for us aboard the Endeavor every morning, noon, and night, and has proven to be quite the chef.